Supporting our engine machining services is a wide range of new quality engine spares as well as access to a range of pre used engine components such as crankshafts, con-rods, cylinder blocks and heads. Our parts manager who has been with us for nearly 35 years and has gained an extensive knowledge in this field. Bearings, Mains, big ends, thrust washers, cam and small ends. Gaskets, head gaskets and sets, bottom and a number of individual ones too. 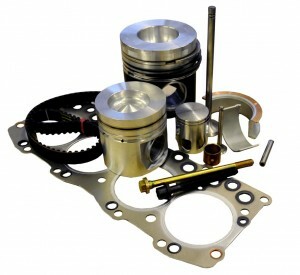 Head bolts, valves and guides, hydraulic lifters, cams, timing kits or just belts. Miscellaneous parts include oil and water pumps. Gasket and cork jointing, wellseal jointing compound. We also supply new cylinder heads and have access to second hand cranks & con-rods.